Earlier this month I went to the National Genealogical Society conference in Raleigh, North Carolina; it was my first time in the Tar Heel State. While I have many southern ancestors who started out in Virginia and Maryland before heading west, none of them – as far as I have found – lived in North Carolina or further south. However, through some of my New England ancestry in Connecticut, I have a brief connection to North Carolina in the late seventeenth century. While not necessarily the “normal” migration, there are several cases of New Englanders going south rather than west, many times settling there permanently. Their residence was short lived. 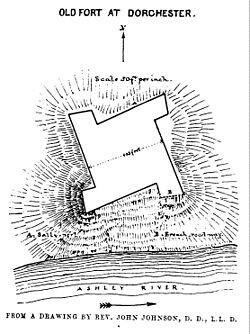 Abraham appears in a few records in Albemarle County (they lived in the part now known as Chowan County), and returned home to Stratford before 1680. Cases of New England migration go back to the early colonial period. Isaac Allerton, Jr., born in Plymouth about 1627, son of Isaac Allerton and grandson of William and Mary Brewster, all Mayflower passengers, moved to Northumberland County, Virginia during the 1660s. Thus his great-great-grandson, Virginia-born President Zachary Taylor (1784–1850), has a small amount of New England ancestry through an early southern migration. However, at the NGS conference in Raleigh, most of the North Carolinians with New England ancestry I met derived from Nantucket Island. While Nantucket and North Carolina were connected in the colonial time period via the whaling industry, in 1771 a large wave of Nantucket and Rhode Island Quakers settled inland in Guilford and Onslow Counties in central North Carolina, where they gave up whaling for farming. I had read about these various migrations years back, so it was nice to meet a couple of people who shared this ancestry. There are, of course, incorrect or otherwise “made up” migrations south. One example involved the ancestry of Abraham Lincoln’s mother Nancy Hanks. Early Hanks genealogists had tried to connect her back to Benjamin Hanks of Plymouth, Massachusetts, when actually her Hanks family was always in Virginia. A common source for these problematic “genealogical leaps” are the ubiquitous online family trees, where “the name is the same” leads hopeful genealogists to combine two unrelated people as one person. But these New England-to-the-South migrations did occur and sometimes result in small “slivers” of New England ancestry in an otherwise Southern family tree. Thomas Kimberly appears here in The Great Migration. Abraham is summarized in Donald Lines Jacobus and Edgar Francis Waterman, Hale House and Related Families (Hartford 1952), p. 671, and appears in documents abstracted in The North Carolina Historical Register, 1: 136, 138. Barbara Lambert Merrick, Mayflower Families Through Five Generations, Volume 24: Elder William Brewster, Part 1, Generations 1–4, 163–81; Gary Boyd Roberts, Ancestors of American Presidents, 33–35. The History of Guilford County, North Carolina. C.C. Child, “The Maternal Ancestry of Abraham Lincoln: The Origins of Nancy (Hanks) Lincoln, A Study in Appalachian Genealogy,” New England Ancestors 4: 1 : 25-29, 55, and C.C. Child, “The Hanks DNA Study: I Was Wrong!,” American Ancestors 17: 3 : 55–57. 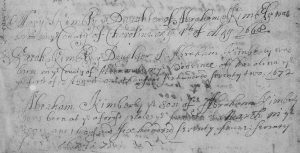 Another New England into the South line I have been researching is that of Ensign Joseph Hilton born about 1681 in New Hampshire, the son of Ann Dudley who ends up in North Carolina where in his will he refers to two of his children as Dudley and Winthrop. Anne Dudley was the daughter of Samuel Dudley and granddaughter of Gov. Winthrop. My 5th great-grandfather David Macy and his wife Dinah Gardner were part of the Nantucket Quaker migration. Both were born on Nantucket, both died in Guilford Co NC. I briefly lived in Greensboro (the county seat) in the mid 1980’s unfortunately before I had researched this branch of my family to know about this. When I moved from NY to NC I found a couple of people with whom I shared an ancestral line in early Ulster County NY. While not a migration from New England, I was still pleasantly​ surprised. Judi, I met a fellow DePuy descendant while working at Ramsey House Plantation, a museum in Knoxville. Her family moved from Ulster County in the very early 1800s. Onslow is a coastal county, not central. Fascinating article! My dad’s paternal branch goes way back in New England and the surrounding states. Several of those branches moved down into Virginia/West Virginia. When I read the surname ‘Kimberly’, it reminded me that I’ve found a lot of DNA matches at Ancestry whose ancestors have variations of that name. 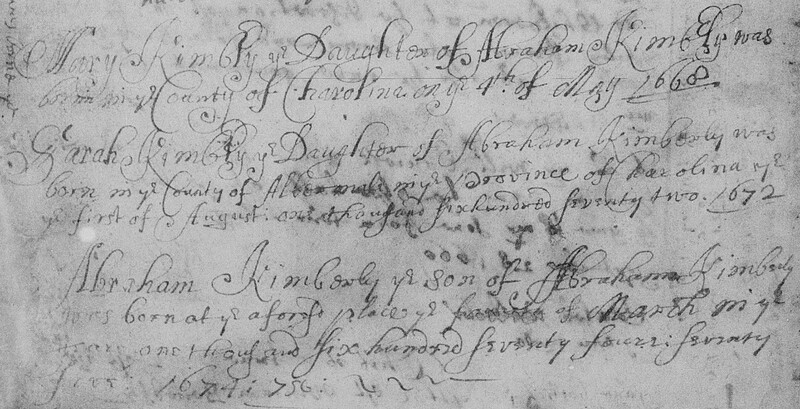 Searched the name, and sure enough found an Abraham Kimberly of Stratford, CT, who moved to Chowan County, NC. Other similar match surnames: Kimberlane, Kimberling, Kimberlin. Your Thomas Kimberly/Great Migration link also shows a ‘Manwaring’ surname that’s common in my matches. I have no idea where these people fit in, as I’m not yet familiar with genealogical resources in the south. My known early ancestors in Virginia settled around Botetourt and Alleghany Counties: Persinger, Dressler/Tressler, Brunnemer who migrated in the north from Germany, then moved south. Another branch, Davis, is very hard to track because of their common name, but we believe they came from Wales. Our direct lines then moved up into Kentucky, Indiana, and Wisconsin instead of taking that southern route west. Check out a large and very early Davis family who were Quakers with Penn, then dissented, ended up in Rhode Island, then NJ, and finally founded a community of Seventh Day Baptists in Salem, WV. I believe that there is still a website if you search for WIlliam Davis of Salem WV. There is another large Davis family I have encountered in Maine research. Manwaring is a common name from the earliest years in New London County, Connecticut. Christopher, are there any written resources specifically about Yankees who relocated to the south in the 18th century? I believe my Garland family was an early Massachusetts family who relocated to VA. The Native depredations caused many from Maine (who had largely migrated from Cape Code and MA) to move south…many did not return in calmer times. In my research I have come to see the Atlantic Ocean as a grand thoroughfare that my ancestors, their family members, and descendants utilized to find new lives, carry on trade, find resources, or simply reconnect with family members who had moved away to other colonies. They hopped on and off ships all along the coast when they were mariners and many of the large families had sons and daughters scattered across a broad territory. What was the cause of the wave of emigration from Nantucket to NC in 1771? I seem to remember something about early disagreements with the governing British?? Thanks for a fascinating read…. Thanks for the tip, Jane, I’ll check out that Quaker migration! It’s fascinating to read the stories of WHY people moved around, isn’t it? Right now I’m following the migration of my early Palatine ancestors (imm. 1710) through to the Mohawk Valley in upstate New York. The British sent them to the colonies, helping them escape the marauding French in Europe. When they got here, their loyalties to the British—and the skirmishes between the Native tribes, French, British, and then the Patriots—made things really complicated. I was able to visit the New Garden Cemetery in Greensboro in 2015. Many Coffins from Nantucket are buried there but the only stones left are those of William Sr and Jr and their wives. William Coffin Sr (1720 – 1803) and his family moved to New Garden in 1773. The Coffin family of Newburyport has descendants in Tennessee. In this line, Cornelius Worcester Coffin’s daughter Isabelle married Thomas Lanier Williams (1849-1908), whose namesake grandson was the playwright Tennessee Williams. My husband’s family married into a branch of this line several generations back as early settlers in Greeneville, TN. I stumbled across the Coffin name when researching his line and was heartened to learn that I’m not the only New England transplant. Thanks, Christopher. Abraham Kimberly was my 9th great grandfather. His daughter, Mary Kimberly, married John Blakeman (1668-1706), grandson of Rev. Adam Blakeman, (1596-1665), my 10th great grandfather, who was the first minister of the original company that founded Stratford, Connecticut. I did not have the name of Abraham Kimberly’s mother nor the marriage date/place for his parents until now. I found your post very interesting. I am also a descendant of Thomas Kimberly (same one? ), through his son Eleazur, born New Haven CT 1638. I didn’t know that anyone from the Kimberly family moved to the South. I also have a lot of Rhode Island ancestry in the 1600’s. In reviewing my Ancestry dna results I have been puzzled by a few match groups where I see a several familiar surnames, but they are all in VA and NC. Perhaps the RI migration to NC is the explanation. As a former Minimal Historian for Sterling, Connecticut, I found several tidbits buried in the land records mentioning moves to the southern states/colonies. I also was an historic interpreter for the Hempstead House in New London. Joshua Hempstead made a trip to Maryland during the 18th century according to his diary. As a descendant of Joseph Lord’s sister Abigail Lord Stevens, it was good to hear others realize that Yankees can appear in the strangest place. Abigail’s husband John and she were already in SC and actually received the land grant before Joseph came. John’s will specified that his sons were to go north for their education. Their son John received the original land grant where Midway Congregational Church stands. We hold an annual church service to remember those brave Yankees who sent rice to Boston during British embargo and fought so strongly for American liberty that the new county was called Liberty. Two brothers, Parker Nye, b. 1793 and Josiah Nye, b. 1796, (sons of Asa and Mercy (Parker) Nye moved from Barnstable, Barnstable County Massachusetts to North Carolina between 1810 when males of the appropriate age can be found in the family of Asa Nye and 1820 when they can not. By the 1830 Federal Census Parker Nye with a household of 5 was living in Robeson County, NC and Josiah Nye also with a family of 5 was living in Columbus County, NC. These brothers and their descendants have four Mayflower lines, all going back to John and Elizabeth (Tilley) Howland.